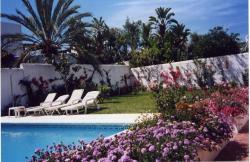 This pleasant Ibiza-style villa in mature garden provides the perfect surroundings for a relaxing holiday. Located in a quiet residential area 15 minutes WALK from Puerto Ban�s, golf courses, beaches, tennis/paddel club and shopping centres. It comprises a large living/dining room, 4 bedrooms ALL with ensuite-bathrooms, a large covered terrace (with BBQ + outside kitchenette) and a fully fitted kitchen all on one level. The kitchen and living room have direct access via the covered terrace to the private pool. Private garage space is available within the property. It also has air conditioning and roof fan for the hot summer days and central heating plus closed fire place for the cool evenings in winter. ADSL is also available. Please don't hesitate to ask for testimonials of very satisfied customers! 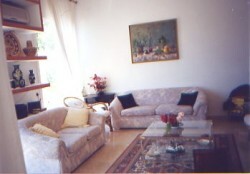 WE ALSO OFFER B&B ACCOMMODATION FOR SMALLER PARTIES. Balance to be paid - on arrival day in ca to arrival.